This renovation request came from reader Kate K., who was missing her Grandmother’s Whoopie pies after going gluten-free. She reports success! I wonder if you’d take a stab at renovating my grandmother’s Whoopie Pie recipe? I haven’t been able to make a satisfactory gluten-free version on my own, and the only one I’ve found at a bakery was not as dense, a fraction of the size, and cost $7 for four! I have to replace any milk with a non-dairy milk, usually soy. I would be so thrilled to have a decent Whoopie pie again! You rock! I am happy to report that the Whoopie Pies taste just like I remember them, and the texture was perfect. Thank you so much for helping me enjoy Whoopie pies again. Preheat the oven to 350F/180C/gas mark 4. Cover two cookie sheets with parchment paper. Sift together the dry ingredients. In a large bowl, mix the vanilla, sugar, oil, milk and egg together; add flour mixture slowly, mixing until it’s evenly incorporated. Using a wet tablespoon, drop on a parchment-covered cookie sheet. Smooth them to the size and shape you want when baked, using wet fingers or a spatula. Bake for 12 to 15 minutes until the tops spring back when pressed and begin to crack slightly. Start with the cornstarch and flour in the pan, slowly add milk, stirring, until smooth, then put on the heat and continue. Cook over medium heat until mixture forms a smooth paste. Cool. Add up to 2 T. white rice flour if needed until you get the fluffy frosting consistency you want. 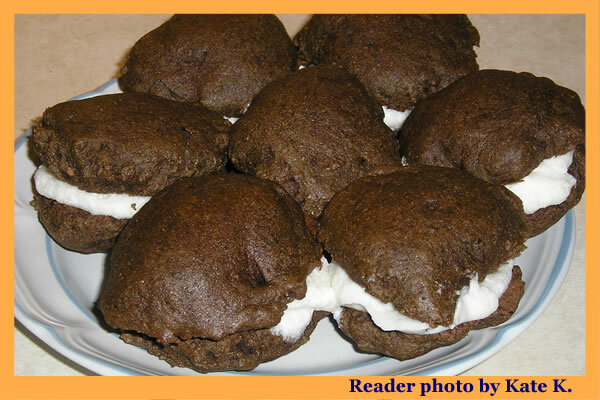 Fill Whoopie pies generously with frosting, making a “sandwich” out of two. Note: I haven’t tried these myself, due to the eggs and sugar. Here’s a recipe for a red velvet Whoopie pie (not GF) from Kitchen Conundrum. And pumpkin whoopie pies from Sacatomato, vegan pumpkin molasses ones from Bran Appetit. Thanks Sara! She was pretty happy and I hope that many more Whoopie Pie fans who are gluten-free can now enjoy them!